Unfortunately for Volkswagen the minivan isn’t growing. In fact, minivan sales have dropped for years and this year along they have fallen 20% (overall auto sales are down 8%.) So after years of co-development with Chrysler/Dodge, the VW Routan is making its debut this fall. Let’s first understand the cutesy name of this family hauler. Routan is an invented word indicating the bond between VW and America. It is a combination of the words ‘route’ and the ‘-an’ suffix VW uses for other European vans. The Routan’s initial marketing push is to drive pre-orders by giving a free gift. The enticement is an U-Promise $1,500 college tuition contribution. There is of course a nice fit between a family focused minivan owner and doing something for the kids. Pre-orders are not an easy thing to obtain unless the car is in high demand with limited supply availability, think a desirable sports car like the Nissan GT-R. But do pre-orders with a gift actually drive more sales? I’m going to break up Routan buyers into two groups: people who are going to buy a Routan any way, I’ll call them “Routan Buyers” and the other group is people considering the vehicle but still undecided, referred to hereafter as “Routan Considerers”. 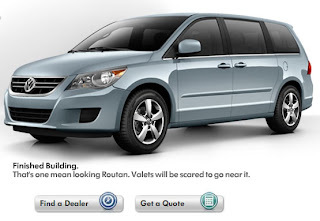 Routan Buyers have already decided to buy the car and are simply waiting for the car to hit dealer lots. Most will not pre-order since the minivan is not a high demand vehicle and availability should be a non-issue at the dealership. Some may do a pre-order to receive the tuition offer. However, is $1,500 really that much toward the typical cost for college? Not really and even less so for parents with kids that have quite away to go before college making the $1,500 incentive less of the total cost. Routan Considerers probably won’t be influenced by a tuition incentive. They too may not value an incentive that will take several years to affect a family’s finances. Considerers also won’t be influenced by an incentive that does not lessen the total cost of the vehicle or give them some instant gratification for their choice. But the larger issue is the matter that any minor incentive is unlikely to shift a buyer to make a decision before he or she is ready. Buyers most influenced by discounts and incentives would most likely pull ahead their shopping decision if employee pricing or a low percentage finance deal were offered. It takes a lot to move an undecided buyer to purchase and few pre-order deals really have the impact to make a considered high-priced purchase more impulsive. In my experience and research, the only significant way of generating pre-orders is by restricting supply at or near launch for a highly sought after vehicle. Limited edition models like the Mustang Shelby GT500KR or a VW Golf R32 create excitement for the product. Minivans really don't generate a lot of passionate excitement, unless of course VW actually brought a minivan worthy of consumer excitement like the Microbus concept. What's the Auto Marketing Blog?